Steve Wilkinson UCU Main Branch President. As a result of extended negotiations your UCU officers have reached a conclusion with directorate which enables us to call off the strike planned for Monday 21st June. This has been agreed with the Regional Official Julie Kelley. There will be branch meetings called to report back on this outcome. We would like to thank all members for your support in what is (and has been) a very difficult period. Detail will follow about a lunch time national anti-cuts rally planned for Monday next , 21st June. The college originally claimed that it needed to make efficiency savings of 3.1million. UCU has been told that 2.7 million has now been saved; this far exceeds the efficiencies management told UCU they needed to make to cover funding changes. UCU believes the college is pushing ahead with compulsory redundancies in order to fund infrastructure projects. UCU have consistently pointed out that efficiency savings can be achieved over a longer time scale. UCU have pointed out that the whole redundancy process puts lecturers under massive and unnecessary stress. UCU have worked extremely hard to support members through this process and have consequently done much of management’s work for them. UCU have requested that the college guarantee that there are no compulsory redundancies. UCU has sought to meet with management this week but been told that the only meeting we can have is on Wed 16th June, 3 weeks since our last meeting and at which the Executive Director for Human Resources can only be present for one hour. UCU has received no response to its presentation to Corporation. If you took strike action on Wed 12th May and will be taking strike action on the 21st June we may be able to help you with sustentation. The branch has limited funds so we are only able to help where need is greatest. Please contact a branch official to discuss how we can support you supporting us. Let us know as soon after the 21st as possible. What good do strikes do? Strike action is the clearest demonstration that lecturers are not prepared to see the compulsory redundancy of their colleagues or the dismantling of educational provision. UCU negotiators have been meeting with college management often twice a week, until recently, to resolve this situation. For the negotiators to have their voice heard it is imperative that they have the backing of their members. This can most decisively be demonstrated through strike action. This college needs publicity. Getting good publicity costs the college a lot. One rally, one strike costs the college a great deal in lost good publicity. Questions are asked by the college stake holders: Corporation, employers, councillors, MPs. UCU organised for the T&A to report on our rallies and strike day; stories have run on the BBC and on local radio. 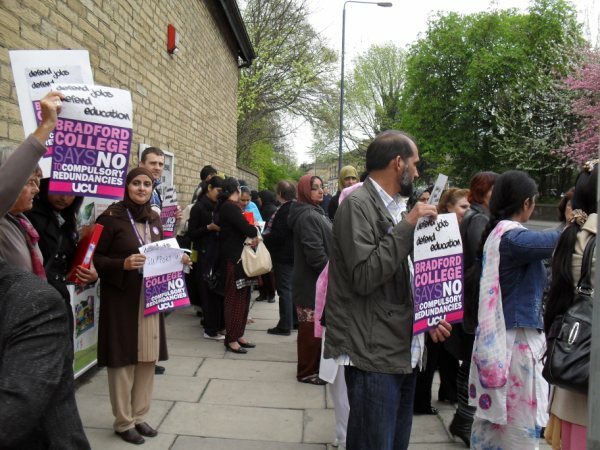 The Principal complained to Sally Hunt, UCU’s General Secretary at the time of the last strike about the negative publicity. Support your colleagues, support the strike on the 21st June. Support UCU’s National Day of Action. At the last Corporation meeting UCU strongly put its case. There has been no official response to UCU what soever.Instead we have all received feedback from the CMT (9th June). In it the Principal reports on the efficiency drive. She says they will “work with any individuals potentially identified as redundant to come to a way forward that might be able to avoid compulsory redundancy.” They have always said this but are still pushing ahead with compulsory redundancies. They are still seeking 7 compulsory redundancies, the sacking of your colleagues in Metallurgy, Counselling, English, Fabrication and Welding. At the Corporation meeting on Thursday 27th May, Steve Wilkinson, president of the main college branch, strongly put UCU’s case. He explained how the college had now achieved the savings it claims it needed. Steve also clearly expressed the stress that everyone facing compulsory redundancy is under. Steve put UCU’s case at around 4pm, immediately after UCU’s lobby. We understand that this was not then discussed by Corporation until 2 hours later. Since then we have been waiting for some response from Corporation – none has been forth coming! UCU met with management 3 times in the week before 1/2 term. Management say they cannot now meet with UCU until Wed 16th, nearly 3 weeks since the last meeting. This is not meaningful negotiation. Go to this link for news from the BBC on possible developments. Our strike and UCU Day of Action on the 21st June are part of a fight to defend education and jobs. I attended this year’s UCU Congress in Manchester as Bradford College’s delegate. This was my first Congress and was quite an experience. The number of delegates attending was very impressive, somewhere in the region of 400 – a few more than we get at our ACE branch meetings. This proved a bit intimidating, given I had to speak to a motion from the Bradford College branch on Anti Trade Union Laws on the first morning! The conference itself was a bit of a rollercoaster ride, with one college and university delegate after another reporting on the situation in their institution: attacks and fight backs. 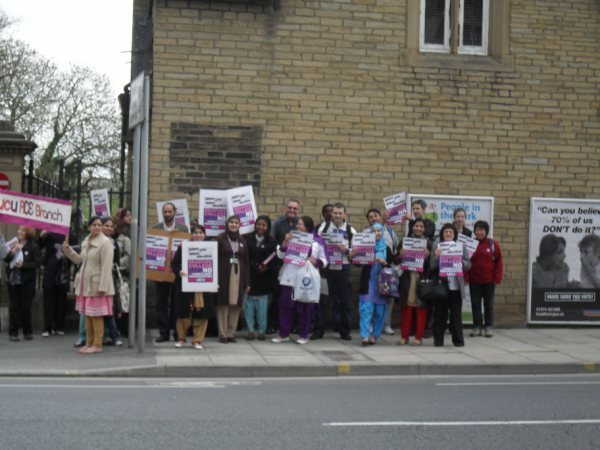 The very clear message was that members of Bradford College are not alone in facing redundancies. Virtually every single delegate who spoke, or I spoke to throughout the congress, reported on the attacks they and their members are facing from management. What became clear from delegates was that while many of these attacks are in part the result of mismanagement and cuts, many are the result of management using the economic situation as an excuse to try and drive through redundancies and changes to working practices in order, as here at Bradford College, to secure a profit. Congress was told of the especially vicious attack on members at Manchester “Super “College. Here the Principal has been attempting to drive through redundancies and intimidate members and branch officers. Manchester City College has a contract to deliver 60% of Prison Education across the country and the branch has over 1000 members. Manchester announced it was seeking over 250 redundancies in the Yorkshire and Humberside region alone. Profits from the Prison contract are being used to service loans so that the Manchester campus can be expanded. Other members under attack are at Sussex, Kings College, Leeds University and Tower Hamlets. All of these delegates spoke of inspirational fight backs by members and students. At one of the evening fringe meetings, a student from Sussex talked passionately about their fight to defend jobs and education. Despite being expelled and fined by the University, students both at Sussex and Kings have occupied buildings and taken back their classrooms. Congress also heard from members of UNITE about the BA dispute. Speakers put the dispute in context and explained what is really going on in terms of management’s goal of smashing the union. Congress was also addressed by Jorge Gamboa from the Colombian trade union movement where workers and trade unionists face intimidation, persecution and even death from the government and employers. This inspirational speech was followed later in the weekend by Christine Blower, General Secretary, NUT, who spoke of the of her members’ victory against SATs. Christine also spoke of the NUT and UCU’s common fight against the carving up and privatisation of education that this CONDEM government is pushing through with academies and private agencies. This is something that we, at Bradford College, are becoming increasingly aware of and will have to respond to. Another theme that ran through congress was that of opposing the undermining of the conditions of UCU members through the use of assessor trainers. Delegates stressed the importance of recruiting these staff in a common fight. Equally pertinent to Bradford members was the issue of observations. Congress heard from Westminster-Kingsway UCU where a boycott of lesson observations is about to enter its second year. Members there, despite being deducted half a day’s pay each time they refuse to be observed, remain steadfast in their opposition to the college’s observation procedure. Congress carried a great many motions over the 3 days: on the Manifesto for Post-School Education, Education and social justice, including affiliation to the national Right To Work Campaign, building campaigns to repeal anti trade union laws and defend pensions, the pay campaign, endorsing the rejection of the 0.2% unconsolidated offer, equality issues, observations, combating racism and fascism and Hate Crime, opposing casualisation, the use of agency staff and opposing academies. An emergency motion condemning “the Israeli act of piracy,” and the “armed attack on the Gaza convoy,” on the 31st May was also carried by congress. A copy of congress’ agenda with all the motions tabled, moved and carried is available from me. I attended 3 days of the congress and fringe meetings on, Fighting to Defend Education, Anti-Semitism, Organising staff on casual contracts and Get a grip on Workloads. I also joined a large Palestinian Solidarity Campaign march through Manchester to protest against the Israeli Government’s actions on the 31st May. On the final day, Sally Hunt, General Secretary, addressed the congress. She spoke about the situation UCU members are in, in regard to the unprecedented attack upon all of us in FE and HE and this government’s disregard for education and those who need it, in favour of supporting the rich. She also talked about the fantastic fight backs from around the country and that UCU is one of the only unions to have increased its membership, currently 120,000. She stressed the need to keep recruiting and that UCU strength lies in its branches and members. Unanimous Vote for Strike Action to Defend Education and Jobs. 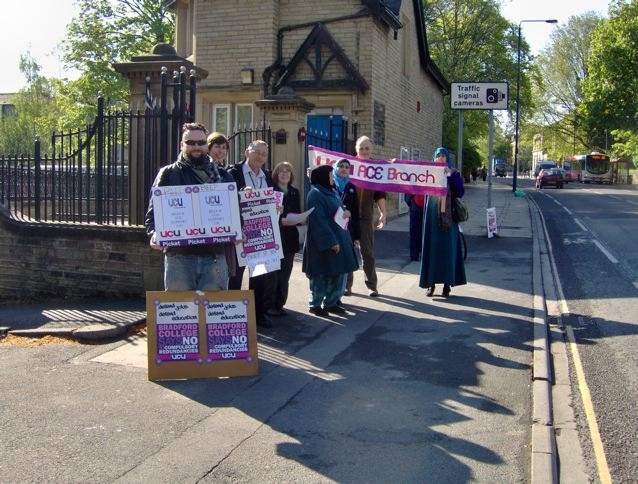 Today, Wednesday 26/5/10, a joint branch meeting of both Bradford College branches voted unanimously to take strike action. Steve Wilkinson, Bradford UCU main branch president, reported back on UCU’s latest discussions with college management. The college has now achieved a saving of 2.7 million, of which 1.9 million is the result of cuts, therefore the college has now made a surplus of £800,000 from staff reductions. Despite this management will still not rule out compulsory redundancies. The pools that remain open are Metallurgy, English, English Language Centre, Fabrication and Welding and Counselling. UCU believes that this is some 7-8 posts. UCU again argued that a college of this size, with a turnover of 60 million, can achieve savings over a longer time period. Staff in pools have now been scored against management’s score sheet and we fear will soon be a step closer to redundancy unless we take further action. Yesterday, Thursday 27th, a well attended lobby of the Governors’ meeting took place outside Westbrook. Representatives from both branches were present as well as some students from the NUS. All governors received a letter written by Steve Wilkinson. This letter was then presented by Steve at the corporation meeting itself. Steve explained UCU’s position; that making members redundant to achieve a surplus was unacceptable. He also described the enormous stress that members now feel themselves under; facing the prospect of being made compulsorily redundant. The presentation was well received, though we were then asked to leave. We are unable to report back as to any discussion or decision that Corporation then reached. A copy of Steve’s presentation will hopefully go on the blog. Don’t’ forget the blog for the latest developments over the holiday period.